We’ve been looking at some new location based uses for Node-RED recently. To this end we’ve been standardising on adding the information under the msg.location property. 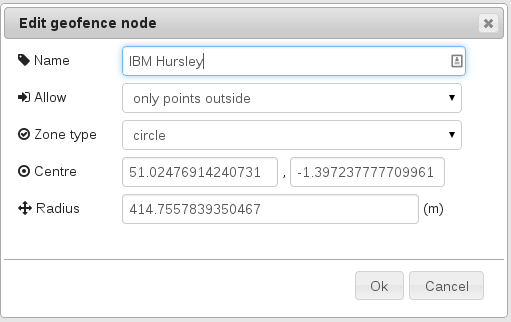 As part of this I’ve been writing a geofence node. This will allow messages to be filtered against specific regions. The first pass worked well supporting both circular and rectangular regions, but configuring it by entering coordinates is not the most user friendly. After a bit of playing with leafletjs and the leaflet.draw plugin I managed to come up with this which should be a lot more intuitive. At the moment it needs to load the leaflet js and css from a external server until we come up with a way to bundle static content inside nodes. This shouldn’t really be a problem as it’s having to load the map tiles from the internet as well. I’d like to find a way to pass in a base URL for the map server and to gracefully fall back to the text version if there is no access to a map server. The map version also supports creating arbitrary polygon regions by joining up multiple points. I’m still trying to get the config dialog to gracefully fall back to the basic version when there is no access to a mapserver but having problems with detecting the failure to download a map title. Any pointers would be gratefully accepted. About a week ago a colleague asked me to help resurrect some code I had written to use our work ID badges to look up information on the card owner in order to log into a system for a demonstration. The ID badges are basically mifare cards so can be read by a NFC reader. The content of the cards is encrypted, but each card has a unique ID. Unfortunately the security team will not share the mapping of these IDs to actual people, but since this is for a demonstration that will only be given by a relatively small number of people it’s not a problem to set up a list of mappings our selves. The original version of this code used nfc-eventd and some java code to the IDs then do a lookup in a little database to convert these to email addresses. It worked but was a bit of a pig to setup and move between machines as it required a number of different apps and config files so I decided to have a go at rewriting it all in Node-RED. 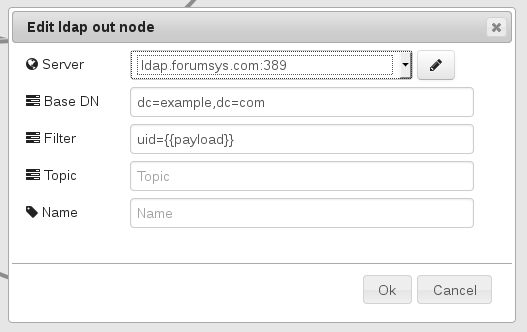 To do this I was going to need 2 new nodes, one to read the NFC card and one to look up details in the LDAP. Both of these actually proved reasonable easy and quick to write as there are existing Node NPM modules that do most of the heavy lifting. The flow has a couple of extra bit, it uses a mongodb to store the id to email address mappings and if there is no match it uses websockets to populate a field in a separate web page to enter a email address to update the database. I did a first pass using the nfc npm and it worked but there was no way to shut the connection to the NFC reader down in the code which meant I couldn’t clean up properly when Node-RED shut down or when the node needed to be restarted. The nfc on npmjs.org is actually a bit out of date compared to the git repository it’s hosted in. So I moved over to using the upstream version of the code. This changed the API a little and still didn’t have a mechanism to allow the interface to be stopped. I forked the project and after a little bit of playing I ended up with some working shutdown code. The only call back is for when at NFC tag is detected and it polls in tight loop so the stream of data from the node is way too high to feed into a Node-RED flow really. The Node-RED wrapper rate limits to only reporting the same tag once every 10 seconds. This is good enough for the original problem I was looking to solve but I still think it can be done better. I’m planning on adding call backs for tag seen and when it is removed, this is similar to how nfc-eventd works. I also want to look at doing NDEF decoding. It depends on libnfc which should work on the Linux and OSx and I’ve even seen instructions to build it for Windows. Once I’ve got a bit further I’ll add it to npmjs.org. This one was even simpler. The LDAP npm modules links to the openldap libraries and does all the hard work. It just needed a config dialog creating to take a base DN and a filter and a connection setup that takes a server, port and if needed a bind DN and password. The filter is a mustache template so values can be passed in. Like with the NFC node, openldap should be available for Linux and OSx and there looks to be a Windows port. I have been playing some more with Asterisk and I’ve got 2 useful bits to share. The simple one first, a recent update to Android (not sure what exactly) means it won’t playback wav files attached to emails. This is a problem as when Asterisk records a voicemail it can be configured to email the recording in wav to mailbox owner. A little bit of googling turned this up http://bernaerts.dyndns.org/linux/179-asterisk-voicemail-mp3. It needed updating a little to get it to work on my Raspberry Pi. Secondly lame doesn’t like the encoding for the wav file (I think it’s because the stored values are unsigned) so we need to run it through sox to fix it first. This not only makes it so I can listen to the messages on my phone and tablet it also makes the mails smaller so they take up less bandwidth. Having used OBi110 to hook my Asterisk VoIP rig up to a standard phone line I was looking for a way to hook a mobile phone to the system. There are 2 options with Asterisk, chan_bluetooth and chan_dongle. Chan_bluetooth uses a bluetooth connection to a mobile phone to make and receive calls. I had a look at this but it meant keeping phone plugged into a charger and having another bluetooth adapter plugged in. 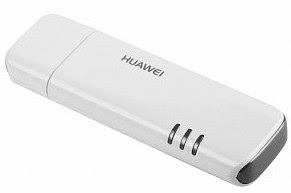 Chan_dongle work with certain Huawei 3G USB modems. These 3G sticks are basically full phones with a USB interface. I’ve already been using one of listed modems for my SMS/MMS project and I had a spare one kicking around. It needed the firmware updating to make it work, which was a bit of a challenge as it required setting up a real Windows machine as I couldn’t get it to work in a VM. Setting up the dongle was a little tricky at first as I couldn’t get a set of udev rules to match the stick properly to ensure it always ends up with the same device names. The code does let you specify the stick using it’s IMEI which helps if you have multiple sticks plugged into the same computer. Once configured it was easy to set up the extensions.conf to allow making and receiving calls. The main reason for setting this up was to have a portable VoIP rig that I can take to different places and not have to worry about a fixed phone line. There is a upcoming hackday that I have a plan for.